Montessori materials at home need not be expensive or require a laminating machine and a paper cutter. It took me less than few minutes to prepare this Valentine Heart and Colander fine-motor activity. 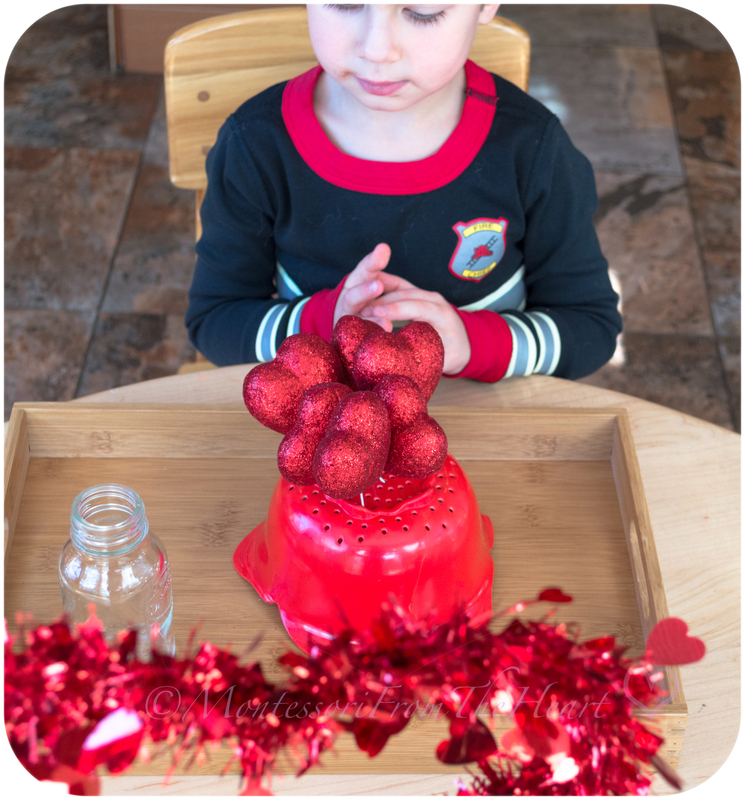 I am sure we all have a colander in the kitchen somewhere, and since 💞love is in the air, we are using ❤️️red heart flower-pot picks, but you can also use red (or any color) straws, pipe cleaners, or wooden heart picks (buy here). My heart picks were a bit long for the colander's hight, so I had to cut them to the correct length. Make sure that your colander has round holes and that picks are small enough to fit into those holes. This easy-to-prepare threading activity is great for toddlers and preschoolers to develop fine-motor control. Growth comes from activity, not from intellectual understanding. - Dr. Maria Montessori. 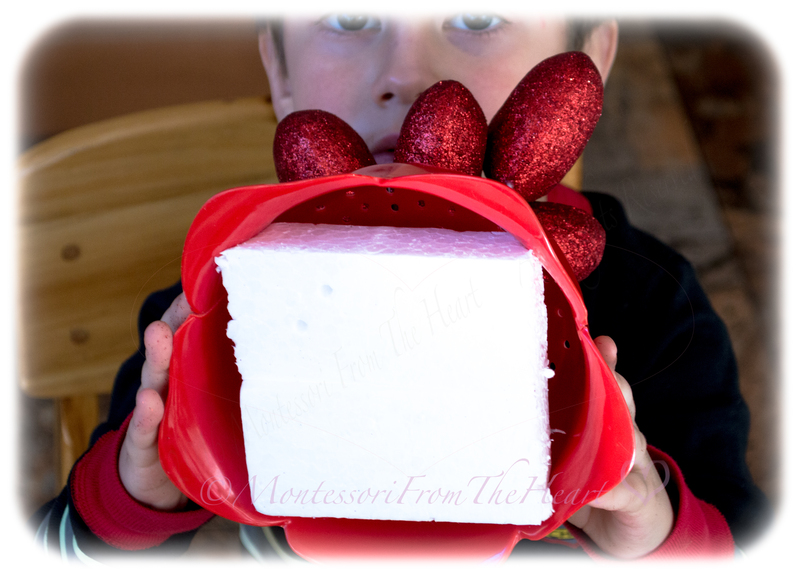 This simple DIY Montessori-inspired Valentine's Day activity for great for home or classroom. Insert picks through the holes and into the styrofoam block so that picks stay put. Adrian, 4 years old, had a lot of fun with this threading activity. If you have a toddler, on the other hand, make sure your picks are safe or offer pipe cleaners for a fun fine-motor activity that is toddler-safe. You can also add a math twist to this activity by encouraging your child to count picks as s/he is inserting them. Or count backward as the child is removing picks or even do a simple addition/subtraction activity. "If you remove one pick, how many would be left?" At the end of the activity, to emphasize the intrinsic motivation or not an extrinsic reward, I would say something like: “You really worked hard at this; you much be proud of your work!” instead of “Great job.” You want your child to feel own accomplishment, rather than showing your own favoritism or opinion. As a variation, offer pipe cleaners to shape as hearts, inserting both ends into colander's holes. "Mommy, this one is for you!" Never help a child with a task at which s/he feels he can succeed … The child becomes a person through work. – Dr. Maria Montessori. We had a lot of fun setting up this simple and inexpensive way to use Montessori at home. I hope you will have fun too! For more on Valentine's Day inspired activities, see here a roundup "❤️Valentine's Inspired Activities for Kids."